Updated Saturday February 24, 2018 by SLL. Several years ago, Smithfield Little League developed a Challenger program for children with special needs. This team enables boys and girls with physical and mental disabilities the opportunity to learn, play and develop a passion for the game of baseball. 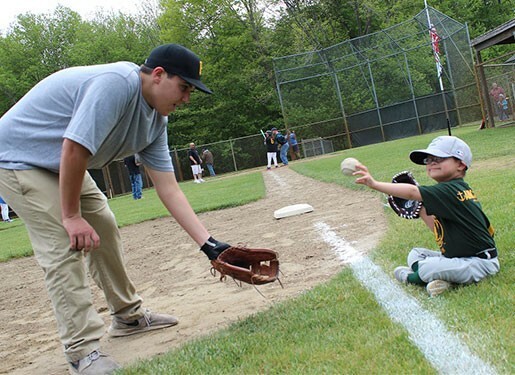 The Challenger team practices baseball skills and competes against other Challenger teams throughout Rhode Island. Children on the team play at their own level. There is no fee to play on the Challenger team. High school students volunteer as “buddies” and assist each player during games and practices. The Challenger program is always seeking buddy volunteers who are provided a signed letter confirming their selfless service. If you know of a child in Smithfield who would like to play on the Challenger team, or if you are a high school student who would like to volunteer, please contact Ralph Boudreau, manager of the Smithfield Little League Challenger team.